We just launched a very convenient feature for those who use time tracking on their mobile device. Time entry was possible using the time clock only, but from now on, you’ll be able to enter time manually, the same way as you can do it in AceProject. At this time, manual time entries cannot be edited once they’re saved. This will be a part of our time sheet revamp, which should happen in the long run. When will we be able to approve expenses and time sheets on the App version? It is very essential that these manual entries are possible but could I ask that you make it possible from within the task as frequently time should be entered while interacting with the task currently it seems you have to exit the task to then redevine in through the My Time entry form which seems counter productive as people might delay getting back to the time rather than capturing it while they were in there. Example. I have been progressing the task remotely then wish to go and update details of progress and comments and finally allocate time. Thank you for your suggestion which I will add to our mobile version wish list. 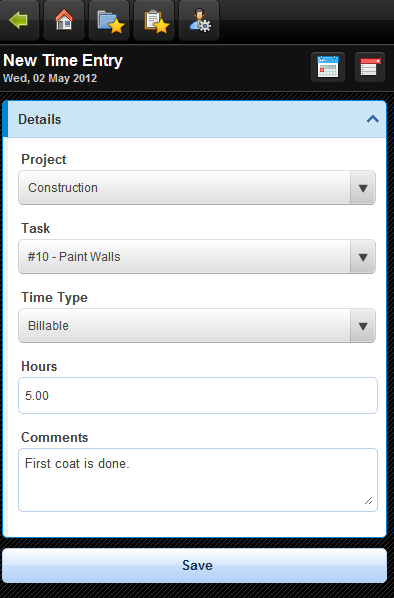 In addition to the need to go out of the projects then to redefine the project and task, the tasks display is not reduced to those assigned it is all tasks for the project which means you could be scrolling through 100s to select it, very frustrating if there was to be only one way to add time manually then it would have been easier to limit it to the task detail window rather than the MyTime page.